The Fate Accompli Kickstarter is over, and now we’re polishing our designs and getting everything ready for the printers. Before we do, we need to know what Add-Ons you’re interested in! Add-On Name Plates: You’ll receive SIX Character Name Plates (approx. 8″x5″), printed on erasable material. 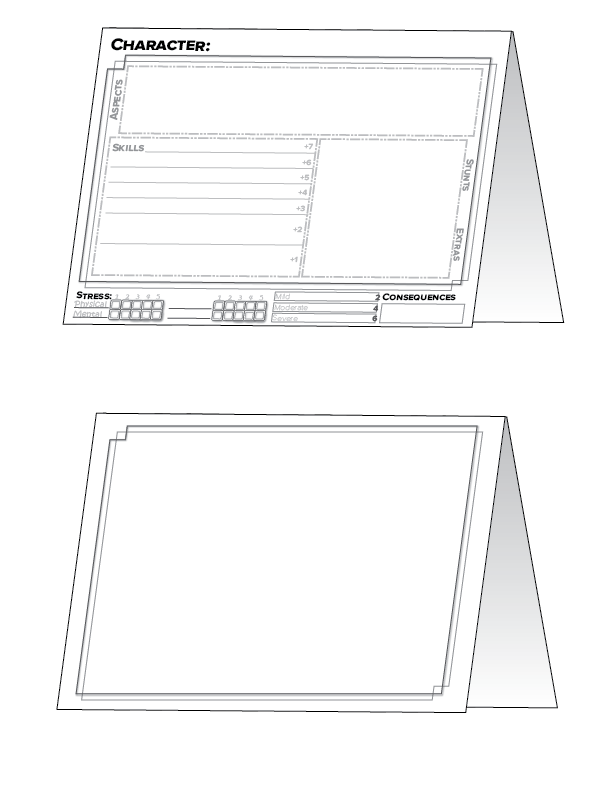 Add-On GM Screen: You’ll receive a four-section foldable GM screen, which will compatible with any Fate game. It will be printed on sturdy card or cardstock material (Warning: will NOT be dry erasable). Add-On Blank Cards: You’ll receive 12 Additional Blank Cards. These cards will have borders and faint lines, but can be used for anything you want. That’s it for the Add-Ons! Which one are you going to pick? Fate Accompli Kickstarter Preview. Click Me! If we reach $6,000, all Fate Accompli cards will be printed with Rounded Corners! This will diminish their effectiveness as weapons, but will greatly improve their aesthetic and longevity! However, we’re still over $500 from that point, and there’s only nine days left; this means you’re running out of time to share this with your friends. Remember, the more people who pledge, the better your package gets! As for future Stretch Goals, we wanted to give players the option of adding more goodies to their base set, so we’re adding on the following bonus: Add-Ons! Unlocked at $6500 – Add-On Name Plates: Printed Name Plates will be available for purchase. Unlocked at $7000 – Add-On Buttons: Buttons will be available for purchase. Unlocked at $7500 – Add-On GM Screen: Printed GM Screens will be available for purchase. See the main page for details on the Add-On components and costs. As always, we end with a request for your thoughts. Anything you’d like to see included as an add-on or stretch goal? Let us know! Fifteen days down, fifteen days to go. We’ve asked you what you wanted for future stretch goals, and the masses have responded: people seem to want to keep it about the cards, and we can dig it! $5000 – PDF BONUS – Name Plates: All backers who have pledged $10 or more (Digital Dabbler and above) will also receive an editable PDF for print-it-yourself Name Plates. The Plates will have room for character info on the inside, and the Character name on the outside. Perfect for conventions and new friends! $6000 – Card Upgrade: Cards will be upgraded with rounded corners. You Wanted More, You GOT More! All Lone Wolf sets will include +1 Extra Card, for a total of 35 cards! All Double Trouble Sets will include +2 Extra Cards, for a total of 70 cards! All Warrior of Destiny Sets will include +4 Extra Cards, for a total of 72 cards! We just hit our next stretch goal of $3500. Amazing! Not only that, but that is the last of our original stretch goals. What lies ahead is completely uncharted territory; we didn’t come up with further stretch goals a month ago, because we didn’t anticipate doing this well! It’s a little early to reveal ALL of our upcoming stretch goals, but we’ve been listening to your requests; rounded corners are high on the wish list, and we’re talking with the printer right now to see if we can make that a reality. In the meantime, I can reveal the next stretch goal: at $4000, we’ll be giving all members that are receiving a digital version of the cards (Digital Dabbler, Lone Wolf of the Web, Warrior of Destiny) a fillable version of the file; this way, you will be able to create NPCs cards on your computer and print them off, or customize the headers to match your campaign or your language! Please, continue to tell us what you want to see, and to tell your friends about the project. The more people jump in, the better it gets for everyone! What are your thoughts? What would you like to see? Funded is Only the Beginning…. We’re absolutely ecstatic to announce that, as of this afternoon, Fate Accompli has now been successfully funded. This dream will soon be a reality! However, if you’d like to see your rewards get sweeter still, be sure to recommend us to your friends. As we hit more stretch goals, we’ll have more in store for you. For example, as of this posting, we’re less than $70 away from having colorized Character cards. Which colors or design will we go with? Only the Warriors of Destiny know, as they’re the ones who’ll be casting the final vote on the design. We’ve been listening to your comments, and we’ll be sure to include more of what you want in the near future. Adios! Day One: Great Googly Moogly! We had originally planned to post when the project had reached the halfway mark, but that happened sometime around lunchtime, and it’s only Day One! We’re ecstatic to see so much support in such a small time. There’s less than $300 between us and the finish line, so tell your friends… that’s where the magic happens (and more importantly, the free Stretch Goals!) And to the many who’ve pledged already, here is our first (but certainly not the last) offer of thanks. The Fate Accompli kickstarter is only 6 days old, and we’ve already been funded and reached 5 of our 6 original Stretch Goals! After the first few amazing days, our group had to get together and discuss what other stretch goals we want to add in the near future. Lastly, our artists Indy and Rachael were able to whip up a stretch goal graphic. TADA! We have lift off! The Fate Accompli Kickstarter is officially launched! Tell your kids, tell your friends! If you don’t have either of those, go out and make some! Let’s make this happen! 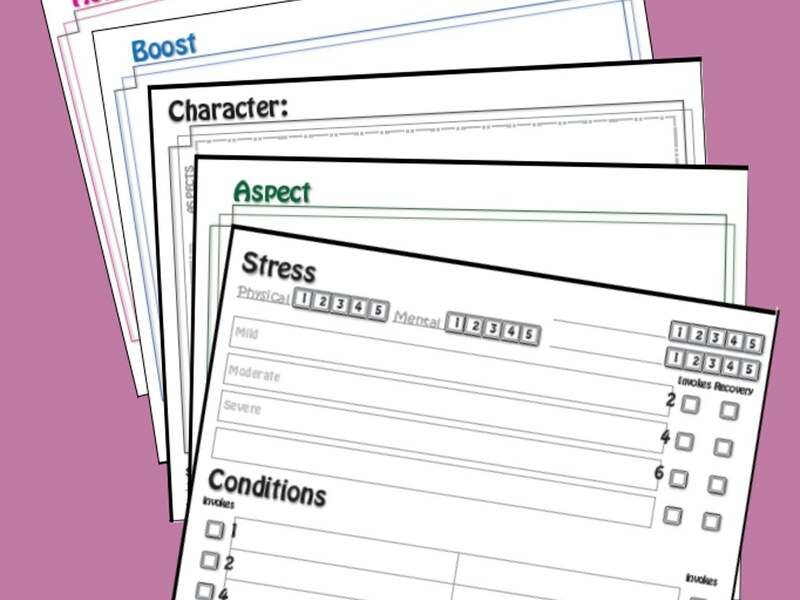 This project will feature dry erase note cards, markers, and other accessories for players to use with their Fate RPG games. Here’s a tiny peek at what’s to come… keep your eyes on this page, and we’ll be teasing more as the kickstarter gets ready to launch! The video is a little long, you can only stretch the community access cable commercial humour so far. I’m also having trouble figuring out the difference between reward levels, are they still under construction? But the kit sounds useful. The rewards are mostly two levels: 34 cards (Lone Wolf) and 68 cards (Double Trouble). The other reward levels add certain things like bonus pdfs, the ability to vote on the stretch goals, etc. Glad you like the look of the kit! Rounded corners are high on my list. So is opening up the Free PDFs to lower level supporters. Thanks! First off, the corners really depends on the quote from the printers (will update on that soon). As for PDFs, the PDF of the cards themselves are only for certain levels (Lone Wolf of the Web, Warrior of Destiny, or higher), but any of the BONUS Stretch Goal pdfs will be added to any level $10 and above (ex. 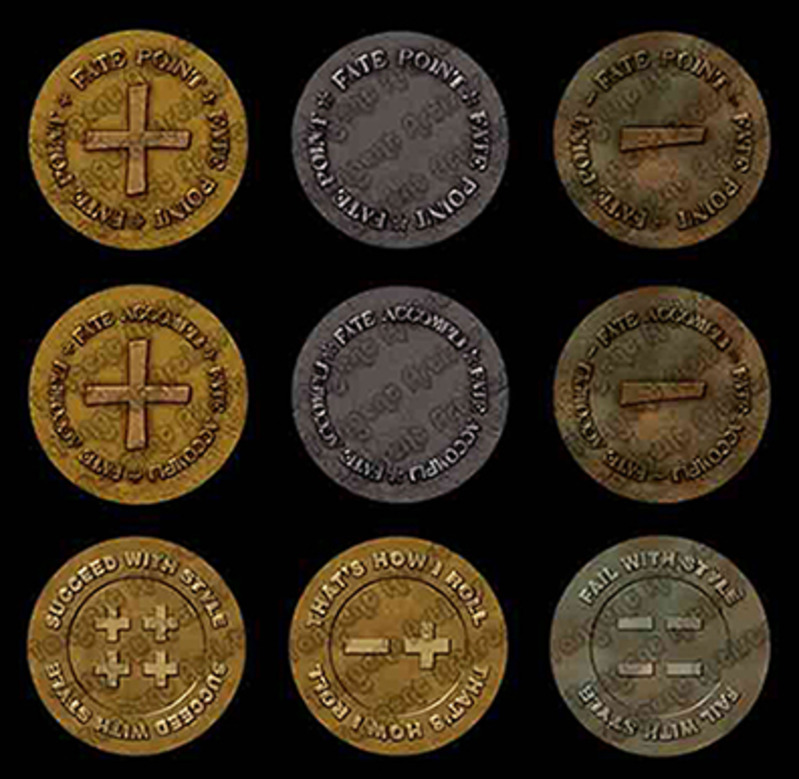 the “PDF Bonus” unlocked at $2600 will give everyone at $10 or more a PDF game resource, such as print-it-yourself game markers). Sadly, adding a free copy of the Card pdf to basic levels (ex. Double Trouble) would be very hard at this point, as it would make the $10 extra that “Lone Wolves” paid irrelevant; which would mean they’d either lower their level (which hurts us), or get charged more for what others get for free (which hurts them).